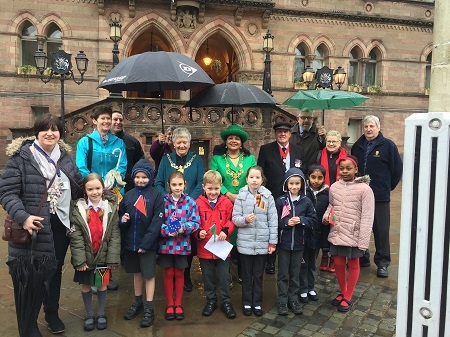 The Lord Mayor of Chester joined thousands of people across the world in a shared celebration of Commonwealth Day 2018. The Lord Mayor, Councillor Razia Daniels, raised one of around 1,000 Commonwealth flags at 10am on Monday, 12 March, as part of the Fly a Flag for the Commonwealth initiative, now in its fourth year. This initiative aims to be a collective public expression of commitment to the Commonwealth. Councillor Daniels said: “It is a huge honour and a privilege to be raising the Commonwealth Flag at Chester Town Hall on 12 March at the same time as hundreds of other flags are being raised across the Commonwealth. “It is very special to me as I was born in Tanzania, which makes up one of the 53 countries in the Commonwealth. This year’s theme, Towards a Common Future, explores how the Commonwealth can address global challenges and work to create a better future for all citizens through sustainability, safety, prosperity and fairness. A personal message from the Secretary-General of the Commonwealth of Nations, The Right Honourable Patricia Scotland QC, and a specially written Commonwealth Affirmation, was read out at each ceremony before the raising of the flag. In a common act of witness around the globe members reaffirmed the commitment of all Commonwealth member states to democracy, development, and respect for diversity.